These poems are traces and markings through continuous topographies – streets, shores, bodies. They offer an experience of language underway, of jumping into the midst. Their shifts and discontinuities open up spaces through the immediate, memory, the personal, the difficulties of being situated or identified. Many of them are shards, borrowings and reshapings of forms, overheard dialogue and writings and art by others, signs and relics of the concrete world, tensions in a moment, the overturning of the ordinary like a leaf, and the resistance of playing at edges. Jones uses the soundtracks of modern lives – weather and television, music and journeys – as she negotiates difficult harbours and debatable terrains with perhaps more tenderness than previously in these times which seem broken and open. 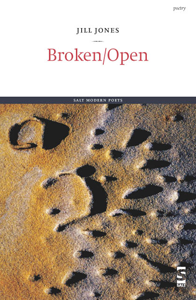 The poems are also voicings of a self under pressure, or close to breaking into the open, imagined, uncertain. They juggle a distrust of too many explanations and a wanting to know, to investigate through word magic and formal strategies. Jill Jones is a Sydney poet and writer. Her work has been published extensively in Australia, New Zealand, Canada, the USA and UK. Her first book, The Mask and the Jagged Star, won the Mary Gilmore Award in 1993. The Book of Possibilities, 1997, was shortlisted for the National Book Council ‘Banjo’ Awards and The Age Book of the Year Poetry Prize. She has worked as a journalist, book editor and public servant. In 1995 she co-edited the anthology A Parachute of Blue (Round Table Publications).